LNet current source, what is that? Copyright© MERG LocoNet© and Rocrail. Kits will be delivered with pre-programmed chips. and is not realy difficult. Pickit 2, Pickit3 both from Microchip. The CAN-GCLN is a CBUS-LocoNet® Bridge for sharing specific hardware modules not available on the other side of the bridge or just for migrating from LocoNet® to CBUS without loss of investments. LocoNet® is a trademark of Digitrax, Inc. The bottle neck is the big difference between the CBUS and the LocoNet transfer rate. CBUS uses 125KBit/s and LocoNet 16KBit/s. This implicates that a burst on the CBUS side can't be broadcasted to the LocoNet side. The goal is to make a buffer as large as possible to deal with this, but filtering will be the best option to prevent overflows. Together with CAN-GC3 this Bridge can be used as LocoNet Command Station with service track. All needed commands are translated into CBUS and visa versa. To keep sessions alive at the CAN-GC3 side it automatically send every 10 seconds idle time a keep alive request for all active slots. This is needed because the default purge time in LocoNet Command Stations is much longer then the session timeout in the CAN-GC3. Support for Uhlenbrock Lissy(IR) and MARCo(Railcom®) Receivers. Support for Wheel counter GCA141. Jumper to enable power on the RJ12 connectors. Loconet throttle support; Dispatch from Loconet and CBUS. Rocrail connected on the Loconet side. Loco 8 functions and lights. Start of Day LocoNet → CBUS. Programming on the main: PoM. Slot ping after 10 sec idle. Extra feature : Just assembled with connectors, this board is very well suitable as a LocoNet hub. Before the dispatch command the loco must have a valid CBUS session which can be forced by a zero speed command in Rocview. Without a CBUS session it is not possible to dispatch a loco for a FRED(i) or other LocoNet throttle. Filtering is needed from CBUS to LocoNet because CBUS makes no distinction between input and output accessory events. Only LocoNet packets are translated to CBUS, not visa versa. Enable the CBUS sensor filter. Translate "CBUS Start of Day" to LocoNet to get the actual LocoNet sensor status. The ID on the CAN bus. Start of Day event number. Filter definition for the event number range to be translated from CBUS to LocoNet as switch requests. 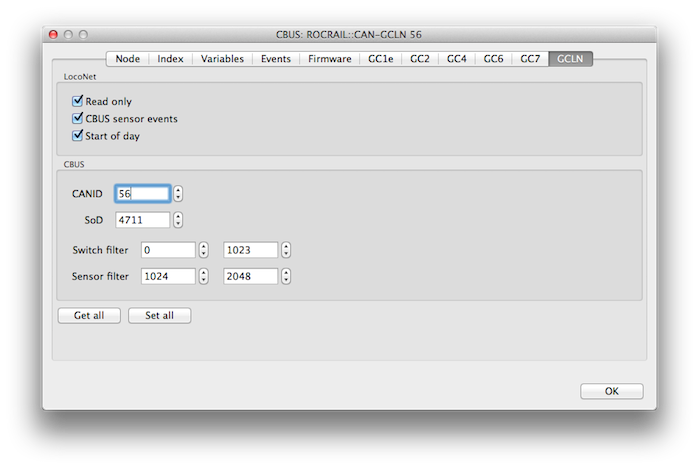 Filter definition for the event number range to be translated from CBUS to LocoNet as sensor reports. Click __here__ for a brief explanation about it. JP2 LocoNet 12V on RailSync Remove if any LocoNet central unit or CAN-GC3 is connected !!!! !